It’s called the Flex Diet and it’s written by Dr. James Beckerman – a socially networked cardiologist working out of Portland, Oregon. The book’s premise is simple and it's not actually a "diet". Rather than provide a set of Draconian rules that everyone has to follow, Jamie offers 200 different "solutions" to help you lose weight. The idea being you get to pick and choose which solutions sound doable to you. The solutions are straight forward, well-laid out, and in the majority of cases easy to implement, and evidence based, while others (like using microwave meals in a pinch), also reflect reality and common sense. 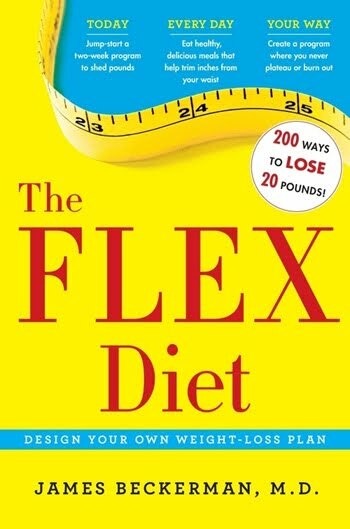 Now I can’t say that I agree with every last one of Jamie's solutions, and personally I believe in a greater emphasis on caloric awareness and a lesser emphasis on pounds lost per week than Jamie seems to, but I suspect that were you to adopt even 10% of the book’s recommended solutions, you’ll likely lose some weight. Four large enough quibbles I have to add for my readers. 1. If you choose the eat almonds solution do yourself a favour. Do figure out the calories involved. Indiscriminate handfuls of almonds, while certainly handfuls of a healthy food, are going to rack up the calories pretty darn quickly. 2 Artificial sweeteners. The data on the use of artificial sweeteners as part actual weight management efforts (both loss and maintenance) specifically demonstrate that they are in fact helpful, and while Jamie discourages their use, I don’t. Ultimately if I had to rank sweeteners in order of danger to health, sugar in its many forms would top the list. The studies that do show associations between sweeteners and obesity tend to be studies that look at all comers, small studies or are poorly designed studies. Those designs are problematic in that there’s a very real likelihood that folks drinking large amounts of diet soda have different dietary patterns and habits than folks who don’t and may feel their diet sodas provide them an allowance to choose unhealthy options by means of the health halo effect. This would hold true as well for the recent hullabaloo over the as-yet-unpublished study that linked diet sodas and strokes where the mass media seems to have completely forgotten that correlation doesn’t prove causality. Of course if you can happily switch to no sweeteners – artificial or otherwise, that’d be ideal. 3. Fasts. I think they’re an awful plan and as someone who has tracked their calorie intake breaking the fast on Yom Kippur I’ll tell you it’s far easier to exceed your total daily burn consuming a single daily meal than by spreading things out well during the day and approaching each and every meal hunger free. 4. Hypnosis and Acupuncture. The data on both acupuncture and hypnosis on weight can be described as preliminary at best, and useless at worst. If weight management were about acupuncture or hypnosis there’d be a lot more acupuncturists and hypnotists and a great many more skinny people. If you want to spend money on something weight management wise how about spending it on my addition to the book - solution 201? Invest in high quality whole foods like a weekly CSA basket of vegetables. 4 quibbles out of 200 sure ain’t bad. As with any weight management effort, success will only find those who sustain their lifestyle changes. When you're trolling through the solutions, make sure only to take on those that suggest to you that you'll be able to happily employ them forever. Pick up the book. Chances are there’ll be something in it that speaks to you.